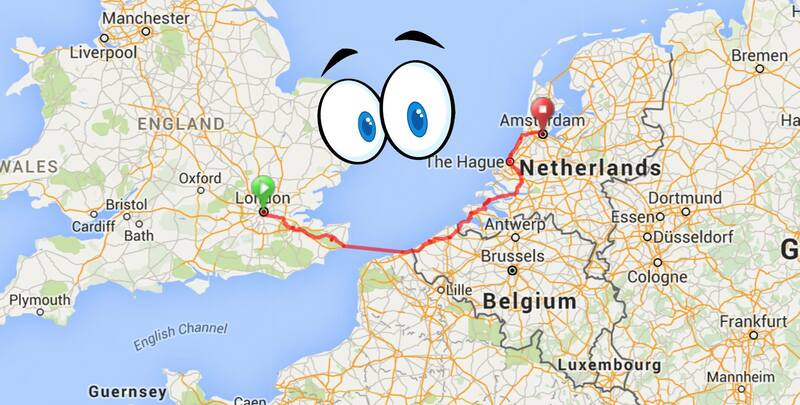 At the beginning of June, Jenny and I cycled to Amsterdam on our Brompton folding bicycles. We travelled over 500km in five days. It was an amazing experience. The first two days were challenging but we kept on pushing and were rewarded by three days of fine weather and very pleasant cycling. What made this trip special was meeting up with friends along the way to share the experience. After last year’s successful trip from London to Paris, I wanted to do something similar this year. Having cycled back from Amsterdam last year in two days via Harwich I was keen to revisit the route along the coast from Amsterdam to the Hague, but I didn’t want to do the the journey from London to Harwich again. Using the ‘Directions’ feature of Google maps I figured out a very rough route via Dover and Rotterdam and figured it could be done in five days. I also noticed that there was a ride planned by Brompton Club Holland on 5th June and thought it would be nice to join that, so I planned the dates around that. Once time off had been confirmed by work and I’d purchased the train and ferry tickets we invited some of our cycling friends to join us. The route was the firmed up, and hotels booked. Hi I think your trip was absolutely amazing – so jealous of you all and wish that I hadn’t been away myself to join you. Hats off to you all! Thanks Alan 🙂 See you on a ride soon.